Experience the new standard in practice guides. The LexisNexis Practice Guide on Florida Civil Procedure: Discovery is part of a 5-volume series that gives you step-by-step guidance on procedural issues and quickly points you to LexisNexis resources that help you build your case. For a complete list, see the full Table of Contents. 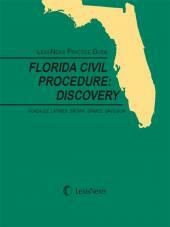 With its concise writing style, streamlined chapter format, abundance of checklists and forms, thousands of references to leading and related cases, cross references to relevant analytical content, and extensive and authoritative guidance from a consultative board of experienced Florida practitioners and judges, you'll find more of everything that makes a practice guide valuable and easy for you to use. Henry Latimer - Shareholder, Greenburg & Traurig, Miami, FL Mr. Latimer was a former Circuit Court Judge for the 17th Judicial Circuit in Broward County, Florida. He concentrated his practice in labor and employment law and commercial litigation. During his last year on the bench, Mr. Latimer was rated "most qualified" judge in the Circuit. After returning to private practice from the bench, in addition to trying complex cases, Mr. Latimer was often called on by lawyers and judges to serve as special master in complex litigation matters. He served on the commission that wrote and implemented arbitration and mediation rules and procedures for the State of Florida. His services were in demand by litigants seeking to resolve their differences through arbitration or mediation. Before attending law school, Mr. Latimer worked for the U.S. Department of Labor, Wage and Hour Division as a Compliance Officer. In addition to having a very active practice in trying complex commercial cases, he served as special counsel to individuals, municipalities, and corporations litigating civil rights, wrongful discharge, sexual harassment, age discrimination and legal malpractice actions. An accomplished trial attorney, he was frequently called to testify as an expert witness in commercial, civil, and labor-related litigation matters. Barry R. Davidson - Partner, Hunton & Williams, Miami, FLBarry Davison focuses in the area of civil litigation throughout the State of Florida , with an emphasis on complex and class action business litigation, intellectual property, antitrust and products litigation. Mr. Davidson also represents airlines and hotel companies and does eminent domain work. He has tried cases in 28 Florida counties and represented every major U.S. air carrier either separately or in industry litigation. Further, he represents International Air Transport Association and several foreign carriers. Among his professional accomplishments, Mr. Davidson brought and successfully settled a federal court action challenging a one billion plus Miami International expansion on behalf of American Airlines with other carriers sharing the cost. He conceived and led legislative efforts to amend penalty portions of industry specific law to eliminate potential multimillion dollar class action liability. In addition, he successfully enjoined misappropriation of Picasso's name on several occasions on behalf of the Estate of Pablo Picasso. Also, he successfully challenged Florida law on constitutional grounds in areas of alcoholic beverage law, electric utilities law and aviation fuel tax. Stephen H. Grimes - Partner, Holland & Knight, Tallahassee, FLMr. Grimes practices in the area of appellate litigation. He retired as a justice of the Supreme Court of Florida in November of 1997, having served as chief justice from 1994-1996. He was appointed to the Supreme Court in 1987. During his tenure on the court, he chaired the Judicial Council of Florida and the Article V Task Force. He also acted as a faculty member of the Florida Judicial College and as an adjunct professor at the Florida State College of Law. He chaired the Legislative Supreme Court Workload Study Commission in 2000-2001. From 1973 to 1987, Mr. Grimes served as a judge of the 2nd District Court of Appeals in Florida with headquarters in Lakeland, Florida. He was chief judge of that court from 1978-1980. While on the court, he was vice-chairman of the Appellate Rules Committee of The Florida Bar, chairman of the Florida Supreme Court Standard Jury Instructions Committee in Criminal Cases, and a member of the Judicial Qualifications Commission for six years. In 1980, he served as chairman of the Conference of District Court of Appeals Judges. Luke S. Brown - member, Holland & Knight, Tallahassee, FL Mr. Brown is a member of his firm's insurance practice group, concentrating on state insurance regulatory issues. He has extensive experience dealing with unauthorized insurance activity and has served as an expert witness in the areas of insurance coverage, contribution, subrogation and indemnity, and as to entitlement and amount of attorney's fee awards in insurance litigation. Prior to joining Holland & Knight, Mr. Brown served as senior executive attorney for the Florida Department of Insurance, where he designed, developed, and implemented a program to combat unauthorized insurance activity, including that of unlicensed multiple employer welfare arrangements. As part of this program, Mr. Brown assembled, trained and energized a team of investigators and Florida insurance regulators, and coordinated efforts with other state and federal authorities, including the Employee Benefits Security Administration of the United States Department of Labor.